In the past, a fake Rolex watch in San Diego was relatively easy to spot. Some of the tell-tale signs include see-through dials or case-backs which reveal the inner-workings of the timepiece; rubber used on the watch band, case, or seal; minute hands that are the wrong size or shape; and serial numbers which have been engraved poorly or improperly. Other indicators of a fake Rolex watch are not so easy to spot. For example, it will be difficult for the average person to tell the difference between a gold plated fake Rolex watch (if there are no other obvious signs) and a genuine 14k or 18k gold Rolex watch. Without a magnifying glass, it also will be hard to spot Rolex’s micro-etched logo which the company now uses to help confirm authenticity, as well as other tiny surface details that differentiate a genuine Rolex watch from a fake one. In recent years, fake Rolex watch makers have become increasingly sophisticated in the manufacturing of counterfeit Rolex timepieces–so sophisticated that sometimes a San Diego jewelry store or pawn shop owner could be fooled if they are not highly familiar with Rolex watches. If you are uncertain about the authenticity of your Rolex watch, you should have it authenticated by either an experienced San Diego Rolex buyer or a jewelry store that deals regularly with luxury timepieces such as Rolex, Patek Philippe, Audemars Piguet, and Cartier. 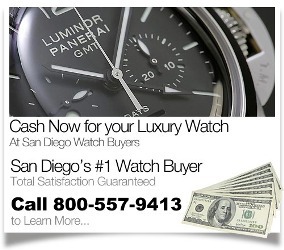 Getting your Rolex watch authenticated in San Diego is easy and shouldn’t cost you any money. Because the demand for pre-owned (used) Rolex watches is so high, many San Diego jewelry stores, jewelry buyers, and luxury pawn shops will happily authenticate your Rolex free of charge. Some will also provide a free market appraisal of your Rolex watch should you wish to sell it. To find a San Diego business where you can get your used Rolex authenticated and appraised, search Google with phrases like “San Diego Rolex buyers” or “Sell my Rolex in San Diego”. Before choosing which business to go to with your Rolex watch, spend a few minutes reading about each company’s credentials and checking their rating with the San Diego Better Business Bureau. With the economy the way it is, many people are turning to pawn shop loans to help make ends meet. That’s not surprising considering that a pawn shop loan involves no credit check AND it protects your credit rating. When people do a mental inventory of what they have to pawn for a cash loan, gold jewelry is one of the main items. However, an even better item for obtaining a decent sized cash loan is a Rolex watch or similar luxury timepiece. The first step in how to pawn a Rolex watch is to make sure that you actually own an authentic Rolex watch. Rolex watches are probably the most copied timepiece on the planet, with hundreds of thousands of fake Rolex watches in circulation. You don’t want to go to pawn a Rolex watch just to suffer the embarrassment of being told that it’s a fake. So, before pawning a Rolex, check out this article which gives some tips on identifying a fake Rolex: Real Vs. Fake Rolex Watches. Okay, let’s move on to the next step in how to pawn a Rolex watch. Do you still have all the original papers that came with the purchase of your Rolex? Bring those Rolex papers, box, receipt, and anything related to the purchase to the pawn shop. That material adds value to your Rolex watch. And the greater the value the bigger the cash loan you will receive when you pawn a Rolex watch. How else can you get a bigger cash loan when you pawn a Rolex? Well, the first thing is, do not refurbish the dial before trying to pawn a Rolex watch. An original Rolex dial that has not been refurbished is worth more. Second, you still can pawn a Rolex watch even if it is not currently working. So, if you are in a tight jam financially, don’t try to fix your Rolex watch before pawning it. And whatever you do, never have a Rolex watch fixed with non-Rolex replacement parts, as this will significantly lower the cash loan you will receive. The next step in how to pawn a Rolex watch is to choose a pawn shop. Not all pawn shops are the same. Some San Diego pawn shops specialize in particular types of items, such as guns, musical instruments, electronics, and fine jewelry. You want to choose a San Diego pawn shop that has a deep knowledge of Rolex watches, a pawn shop that understand the differences between a Rolex Submariner, a Rolex Explorer II, a Rolex Milgauss, a Rolex Sea Dweller, and other popular Rolex models. How can you tell whether a San Diego pawn shop has Rolex expertise? Check their websites. Do they provide people who want to sell and pawn Rolex watches with useful information? Does the owner or management of the pawn shop have provable professional knowledge in fine jewelry and luxury timepieces? When in the pawn shop, check out their showcases. Do they display luxury timepieces from brands like Rolex, Patek Philippe, Cartier, Hublot, and Chopard? If the answer to these questions is yes, then you have undoubtedly found a good San Diego pawn shop in which to pawn a Rolex watch. Speaking of questions. Here are 4 questions that people often ask when they are wondering about how to pawn a Rolex watch. 1) Before I pawn my Rolex watch is there a credit check? 2) How big of a cash loan can I expect when I pawn my Rolex watch? That is difficult to say because the cash loan amount will depend on the make and model of your used Rolex watch and big a demand there is for it among Rolex buyers. However, unless you have a rare, limited edition Rolex or classic vintage Rolex in great condition, you should not be expecting a pawn shop loan that is anywhere near the retail price which was paid for your Rolex. If you want to get a general idea of what your pre-owned Rolex is worth on the resale market, try searching “Completed” sales of your make and model of Rolex watch on eBay. 3) What will the the interest rates be when I pawn my Rolex watch? When you pawn a Rolex watch the interest rate will vary depending on the value of your pre-owned Rolex and what San Diego pawn shop you are dealing with. 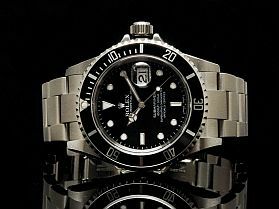 San Diego Jewelry Buyers is one of Southern California’s most recognized providers of pawn shop loans on Rolex watches. And if you were to pawn a Rolex watch that is valued at $5,000 with them, it would cost you $200 a month for the use of this money. 4) What will happen if I pawn my Rolex watch and don’t pay back the loan? If you are worried about a bad credit report when pawning a Rolex watch, don’t be. San Diego pawn shops (and all pawn shops for that matter) never communicate with credit reporting agencies. If you fail to pay back your collateral loan, the pawn shop will simply keep your Rolex watch and try to resell it to collect the money which they loaned you. Your good credit rating is protected. How to Sell a Used Rolex to a San Diego Rolex Buyer? If you want to sell a Rolex or other high-grade Swiss mechanical watch to a San Diego Rolex buyer, this guide is for you. While Rolex watches are made to last a lifetime, many times people decide they want to sell their Rolex, perhaps to upgrade to a more unique model or to get some quick extra cash. Whatever your reason is for selling your Rolex, there are a few things that you should keep in mind when approaching a San Diego used Rolex buyer. First thing to remember is that professional watch buyers look for original Rolex parts when assessing the resale value of your used Rolex. It is this resale value on which they base their purchase offer, not the retail value of a new Rolex watch. So, if at some point you (or someone else) added non-Rolex parts to your watch, this will lower its worth considerably. How can you get the best price for a used Rolex? Well, one way is by keeping the original box and papers with which the watch was sold. This is very important to remember should you ever purchase a new Rolex, which might unexpectedly be sold some time in the future. Proper paperwork and boxes help assure the next person that purchases it from the San Diego Rolex buyer that the timepiece is not a counterfeit. If the band on your Rolex is slack and/or dingy, this will affect the buying offer, because the used Rolex buyer will have to invest time and money in tightening up the band and making it appear like-new again. But whatever you do, do not try to refurbish the dial of your pre-owned Rolex before selling it. While dials of certain models are sometimes refurbished by highly trained watch specialists, collectors generally value the original dial more than a refurbished one. By refurbishing the dial you could significantly be reducing its resale value. In addition, don’t go ahead and try to fix your Rolex before selling it. A Rolex that is not working often will still bring a decent buying offer, especially if it is one of the most sought-after models. Before going to talk with a San Diego Rolex buyer, know exactly what you are selling and what materials were used in the manufacturing of your timepiece. Is it made of stainless steel, platinum, or gold? If it’s a gold Rolex, is the gold 14k or 18k? Is it a solid color or two-tone gold? If possible, don’t leave these questions to the watch buyer to answer. Research your watch online and try to get the answers yourself. Sometimes going to a dedicated Rolex buyer isn’t the best option for San Diegans. There are those who have a friend, co-worker, or relative that is interested in buying the watch, while others decide that they would like to try their hand at selling their Rolex on e-bay. If selling your watch to an acquaintance who has concerns about whether the Rolex is authentic or counterfeit, have them read this informative article: Real Rolexes vs. Fake Rolexes. If going the e-bay route, sell only to buyers who are located in the United States, take a picture of your Rolex watch that shows the serial number before shipping it, and for receiving payment use a Paypal account that is linked to a bank account with only a very small balance to protect you from fraud. Lastly, before going to a San Diego Rolex buyer to sell a Rolex watch, check them out with the Better Business Bureau and only deal with those business that have been operating for more than a year, have an A or A+ rating, and who specialize in Swiss timepieces. San Diego watch enthusiasts will be glad to hear that rare timepieces continue to command top prices on the international market. 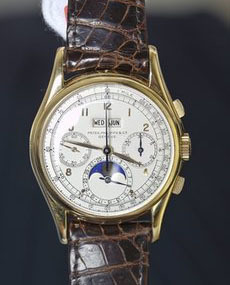 A Patek Philippe perpetual calendar chronograph wristwatch went for nearly 6.26 million Swiss francs ($5.86 million) at a recent Christie’s auction. It was sold to a Swiss private museum and set a record for the highest price paid for a yellow gold watch sold at auction, according to Christie’s. The 1943-44 watch features an avant-garde case design and was a forerunner for future generations of complicated wristwatches. It was sold as part of a 20-piece collection put up by an anonymous seller. “I started buying watches in the 1970s, at a time when these amazing objects appealed to very few collectors and even fewer scholars were exploring this charming field. In my opinion, wristwatches are the most beautiful wearable item created in the 20th century,” Christie’s quoted the anonymous seller as saying. “European bidders were fiercely challenged by international collectors, especially buyers from China,” he said of the sale. The name of the museum wasn’t revealed, but Geneva is home to a Patek Philippe museum, which contains the best pieces made by the independent watchmaker. The entire collection netted 16 million Swiss francs, making it the most expensive private collection of watches ever sold. Bloomberg is reporting that Christie’s International raised 19 million Swiss francs ($19 million) in the biggest watch auction this year. Included in the lots was a collection of 10 Patek Philippe watches for almost double the low estimate. 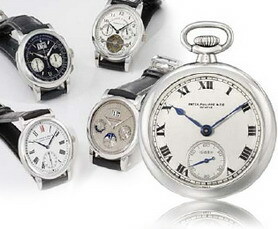 Nine of the top 10 lots were Patek Philippe, and one was Rolex, in the auction that took place in Geneva. Christie’s estimates the entire sale to raise 10 million francs to 15 million francs. The most expensive timepiece was a Patek Philippe 18-carat gold watch with a calendar that adjusts for leap years, sold for 2.4 million francs to a Swiss museum, Christie’s said. The collection of Pateks sold for 5.8 million francs. Watch auctions have been successful, reports Bloomberg, even as Swiss watchmakers suffer from the worst recession since the Great Depression. Rare pieces continue to attract more demand than newly made watches, as Swiss watch exports have dropped 26 percent in the first nine months of this year in value. A Sotheby’s auction of timepieces in the same Swiss city on Nov. 15 raised 5.1 million francs, within the auctioneer’s estimated range of 4.15 million francs to 5.71 million francs. In other watch news, the family that controls Porsche SE, the maker of the 911 sports car, is selling watches from its private collection at a charity auction in London today. Ferdinand Alexander Porsche and his sons have entered 49 watches into a sale to be held by Bonhams on Dec. 2. The group includes examples by Eterna, Porsche Design, Rolex, Panerai, Jaeger LeCoultre, Breitling and Omega, is expected to fetch 100,000 pounds. Proceeds will be donated to the oncology research department of the Robert Bosch Hospital, Stuttgart, Germany, said Bonhams. San Diego watch buyers looking for deals on used watches, such as second-hand Rolexes and Patek Philippe timepieces, should proceed with caution. The North County Gazette reports that a watch enthusiast has been charged with defrauding a California man out of $100,000 by offering a nonexistent Patek Philippe watch for sale on an internet website that targets watch collectors. The man in question was charged with second-degree grand larceny, second-degree criminal possession of stolen property and first-degree scheme to defraud and faces up to 15 years in prison if convicted. Prosecutors say the charged man used a wireless connection to gain the Internet Protocol (IP) address of a neighbor and set up an account under the name Jonathan Miller. Thereafter the defendant is alleged to have made contact with an Oscar Ho of California, regarding the sale by “Miller” and the purchase by Ho of a Patek Philippe Model 5970G watch for $100,000. After a series of negotiations, Ho allegedly sent $100,000 by wire transfer to a Bank of America account belonging to the defendant. Despite repeated requests, Ho allegedly never received the watch. 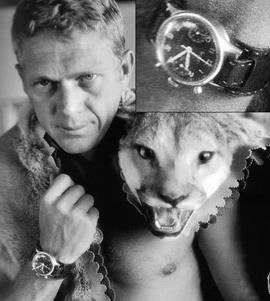 National Jeweler has published an article covering the sale of watches and memorabilia from the late Steve McQueen, the legendary actor who rose to fame during the 1960s in films such as Bullitt and The Great Escape. The McQeen stash was among the pieces that inspired serious bidding at Antiquorum’s summer auction in New York City. The June 11 auction brought in a total of $5,706,324, reports National Jeweler, with McQueen’s vintage Rolex, Ref. 5512, fetching an impressive $234,000, which was twenty times its estimate and a world record for that reference. A total of 81 percent of the 416 timepieces in the summer auction were sold by lot and 122 percent were sold by value. Bids came in from across the globe, including from Hong Kong, Taiwan, Italy, Germany, France and Romania. In addition to the telephone, room and commission bidders, 478 bidders competed via the Internet. Among the additional McQueen pieces featured in the sale were the actor’s Scott Super Squirrel motorcycle painted by Von Dutch, which sold for $276,000, double its estimate, and the Heuer “Monaco” he wore in the 1971 racing film Le Mans, which sold for a world record $87,600. Other watches that sold for impressive amounts included Patek Philippe’s rose gold Ref. 5004 and pink gold Ref. 5970, which sold for $252,000 and $132,000, respectively, as well as Patek’s “Limited Edition Annual Calendar with Silicon Escape Wheel,” Ref. 5250G, which fetched a record $138,000. Rolex’s “Double Red Sea Dweller,” retailed by Cartier, sold for $91,200, and Ref. 6239, a stainless steel “Paul Newman Daytona” attained $84,000, while the “Pro-Hunter Black-Carbon Daytona” sold for $42,000. In addition, A. Lange and Sohne’s “Pour Le Merite” sold for $156,000, and Jaeger-LeCoulte’s “Platinum Master Minute Repeater,” sold for $126,000. Thomas Mulier in Geneva reports for Bloomberg.com that Christie’s auction house raised 15.1 million Swiss francs ($14 million) in a watch auction in Geneva yesterday, after a rival Sotheby’s auction missed the low end of its estimated range. The top lot was a pre-owned Patek Philippe watch with a calendar that automatically adjusts to leap years that sold for $1.8 million, according to the London-based auctioneer. The entire sale was estimated to raise 8.9 million francs to 12.8 million francs. A Sotheby’s auction of timepieces in the same Swiss city on May 10 raised 3.75 million francs, missing the low end of the sale’s estimated range by about 50,000 francs. Christie’s sold a brass telescope given to Napoleon Bonaparte in 1800 as he traveled via Geneva to join a battle in Genoa for 147,000 francs, about triple its top estimate. The auction house also sold a Breguet carriage clock originally made for the Queen of Naples for 723,000 francs, exceeding its high estimate. It will be displayed in the Breguet museum, according to Aurel Bacs, co-head of Christie’s global watch unit. Estimates don’t include the buyer’s premium, reports Mulier, which for Christie’s were 25 percent of the price for the first 60,000 francs, 20 percent from there to 1.2 million francs, and 12 percent of any amount in excess of that. If you have a valuable timepiece, don’t forget to check out the San Diego Luxury Pawn Shop Report’s tips for selling a used watch. National Jeweler reports that Patrizzi and Co.’s April 19 horological auction brought in more than $6.7 million. Three commemorative-edition Patek Philippes earned the top prices. An 18-karat yellow gold Patek Philippe minute repeater with perpetual calendar and moon phases was the star of the show, selling for about $349,787. The wristwatch was produced in a small series in 1989 to celebrate Patek’s 150th anniversary. 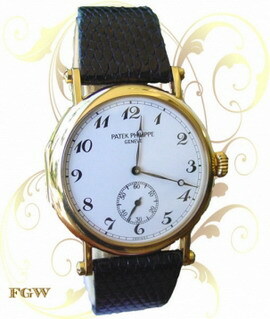 A Patek “Officer’s style” minute repeater chronometer wristwatch, sold for about $332,724. The timepiece was made in 1997 as one of 10 watches in 18-karat yellow gold to commemorate the new company headquarters just outside of Geneva. Finally, a Patek Philippe minute repeater wristwatch produced in 2004 as one of five to mark the 50th anniversary of George Pragnell Jewellers in London, sold for about $315,718. Patrizzi and Co. said in a media release that in addition to the enthusiasm for Patek Philippe, bidding was competitive for several Vacheron Constantin and Panerai wristwatches, as well as for a Hublot “Big Bang Tourbillon Solo Bang,” which nearly doubled its estimate. Also selling well were a Breguet “souscription” watch in 18-karat gold that was originally sold to Prince Ferdinand in 1812; a Louis Audemars No. 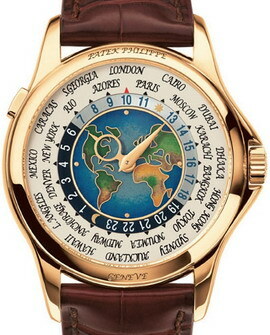 12131 circa 1875; and a Patek Philippe and Cie yellow gold keyless “World Time” gentleman’s dress watch with a cloisonne enamel map of North America. The timepieces sold for about $36,142, $77,457 and $79,178, respectively. 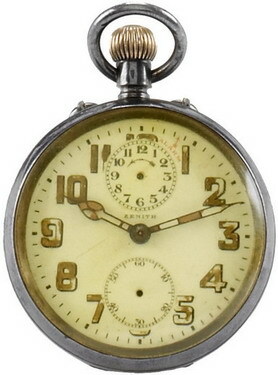 JCK Online reports that Mahatma Gandhi’s pocket watch and personal belongings realized just under $2.1 million as part of the Antiquorum Auctioneers sale of Important Collectors’ Wristwatches, Pocket Watches & Clocks, held March 4 and 5 in New York. “Despite continued global economic concern, we have achieved tremendous results for our first auction of 2009,” said Evan Zimmermann, Antiquorum president and chief executive officer. The auction also included a watch belonging to both U.S. president John F. Kennedy and Greek shipping magnate, Aristotle Onassis. Known as the Kennedy Onassis watch, it is the only known item connecting JFK, Jacqueline Kennedy, and Aristotle Onassis. It fetched $120,000. Another watch of great significance in the sale was the Patek Philippe Henry Grave’s platinum minute repeater, which sold for $630,000. The watch belonged to the late Henry Graves Jr. who inspired Patek Philippe to create some of its most complicated watches to date. Several other Patek Philippe timepieces achieved excellent results, including: The Ref. 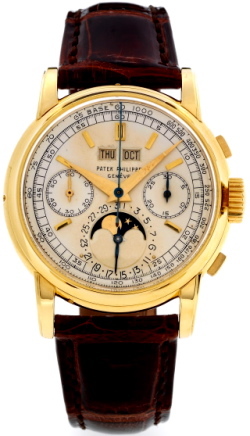 5016 in yellow gold, lot 536, fetched $ 494,000; the “TV Watch” in white gold, Ref. 5020 (lot 526), sold for $180,000; the Ref. 3970 in white gold (lot 525) attained $ 108,000; and the yellow gold “Celestial” wristwatch (lot 120), which sold for $186,000. An Audemars Piguet watch, the “End of Days,” (lot 435) sold for $ 42,000. A Cartier Art deco desk alarm clock sold for $32,400, three times its’ pre-sale estimate. Do you have a mechanical timepiece or used watch that you are looking to sell in San Diego? If so, read this article before approaching a buyer: San Diego Tips: Selling Your Used Watch.